The pasta experiment keeps on going. Above is my second attempt. I had some beef stew meat in the freezer that I bought a while ago to make borscht. That never happened. I also had plans to make my first ever trip down to Paulina Market. I felt a little bad because it's been a while since I've been down to the Apple Market, but I'm just not buying that much meat any more these days. But I was not feeling badly enough not to be excited about my coming adventure. But my freezer has enough meat in it; I needed to clear something out to make room for the new. 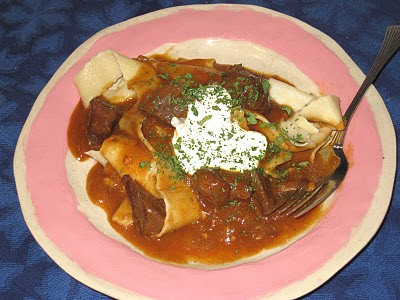 I had recently run across a recipe for goulash that a book rep had given me years ago. It was her family recipe, and it seemed easy enough. I had half a package of egg noodles left over from my pot roast so I was going to use those, but as the day progressed and I kept thinking about it, I decided to take another stab at handmade pasta. The main reason I had decided not to make the pasta myself was because I was gong to make it Monday night, and I thought it would be too much work to cook the goulash and make the pasta on a weeknight. But then I started thinking about the fresh pasta that is sold at the grocery store - I was pretty sure that didn't have to be cooked on the same day it was made, so I did a little investigating and discovered that once the pasta is made, rolled out and cut, it can last up to three days in the refrigerator. So I decided to make the pasta Sunday night, and then I would only have to cook it up on Monday after I made the goulash. It worked beautifully. I decided to make papardelle this time, to go with the goulash. It only takes a few minutes to mix up the dough, then it rests for about twenty minutes, and then it takes maybe half an hour to roll it out and cut it. I had it in the refrigerator and ready to go in short order. I came home from work Monday evening and got the goulash started, so it could simmer for a couple of hours. After an hour, I put a pot of hot water on the stove to get it simmering so it would be ready for the pasta when I needed it. After the meat was tender and the goulash was about ready, I brought the water to a roiling boil, added salt, and threw in the noodles. They were ready in about two minutes. I could not discern any difference in the quality of this batch from the first batch I made, which I cooked right away. I am so happy to have discovered that you don't have to cook the pasta on the same day you make it. Breaking it up into two stages makes it much more convenient to plan a meal with handmade pasta. Following the rule of three, I fully expect to have the pasta down by the next time I make it. It should go well with the lamb chop I expect to pick up at Paulina Market. The goulash? It was ok. The ketchup made it a little too sweet, but other than that it was a good recipe. The next time I make it I will leave out the ketchup. Or maybe by then I will have made my own and it will not be as sweet. i'm hyped you got to the pasta making. Thanks, I'm hyped too. I love making pasta, and it's so easy! Glad you like this food, t-b-a.